Over the last few years, the resurgence of interest in vinyl has taken many within the music industry by surprise. Some went as far as say that the resurgence of interest in vinyl would be short-lived and was no more than a passing fad. How wrong they were. Especially one particular label manager who back in late-2014 was particularly scathing about vinyl’s newfound popularity. He believed that the vinyl bubble was about to burst, and there was no way ‘his’ company he managed would ever release their vinyl. This musical Nostradamus’ other forecast was that within a couple of years, nobody would be buying CDs. They were going the way of the dinosaurs, Nostradamus believed. The future was about streaming and downloads he proudly announced, which was his business model and was how his company were going to make their fortune. Alas, this was flawed thinking. Today, music’s very own Nostradamus is no longer in the position he once was. In footballing terms, he has been relegated from music’s top division. He’s no longer the mover and shaker he once was. Not after his company suffered huge losses. Someone else was brought in to rescue the situation, and Nostradamus was reduced to a bit part player. The company he once ran now releases all of their albums on vinyl and CD. Indeed, they’ve even released several vinyl only releases, including double albums and box sets. It’s a similar case with CDs, with box sets and double albums hitting the shelves of record stores. Downloads are still available, but the label’s core customer base are people who buy physical products. While they’re first and foremast music lovers, they’re also collectors of music on various formats and are willing to pay for the privilege. The new person running the company understood the company’s customer base and has set about to releasing the music they want to buy. This includes music on vinyl, which he hopes will help return this once proud company to profitability. Many other companies have realised there’s currently an insatiable appetite for vinyl. This includes HMV, who last year, released their Exclusive Vinyl series. It was a huge success, and they decided to repeat the exercise. One of this year’s releases was Red Hot Boppers, which was recently released as a limited edition of 1,000. Red Hot Boppers features ten tracks that have featured on the Sun Rockabilly Legends’ Series. Billy Lee Riley’s career began in May 1956, when the twenty-two year old released Trouble Bound on Sun. After that, eight months passed before Billy Riley returned. This time, it was with Billy Riley and His Little Green Me, who released Flyin’ Saucers Rock and Roll in January 1956. 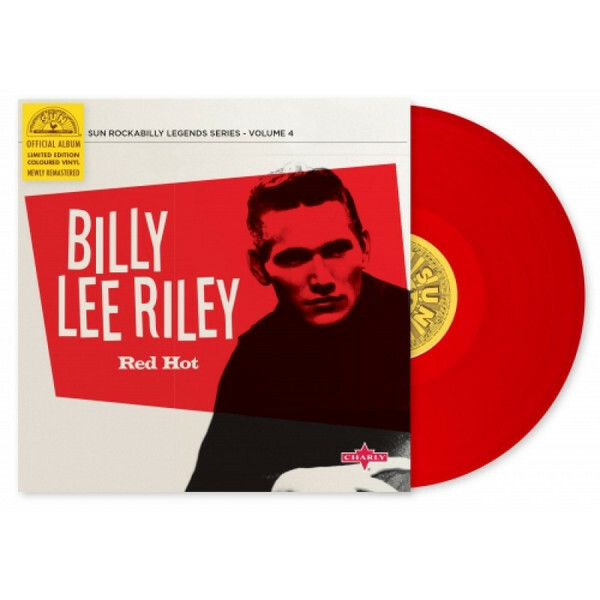 Eight months later, Billy Lee Riley returned with his sophomore solo single Red Hot in September. It featured on Sun Rockabilly Legends Series Volume Four-Red Hot and also provides an explosive start to the Red Hot Boppers compilation. 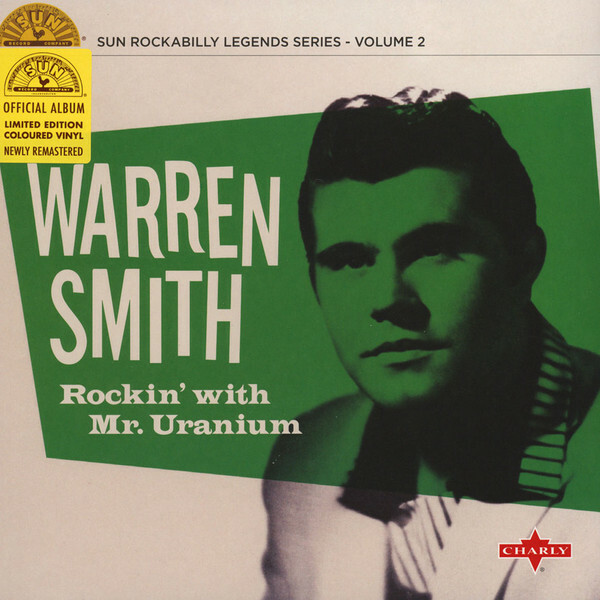 When it came to compiling Sun Rockabilly Legends Series Volume Two-Rockin’ With Mr Uranium, which was dedicated to Warren Smith, one of the songs chosen was Red Cadillac And A Black Mustache. This was a song that Warren Smith recorded in 1957, but never saw the light of day until 1973. Three years later, in 1976, Red Cadillac And A Black Mustache was released as a single by the British label Charly Records. Forty-one years later, it makes a this hidden rockabilly gem makes a welcome return on the Red Hot Boppers compilation. When Sonny Burgess released his debut single Red Headed Woman in August 1956, tucked away on the B-Side was the piano driven We Wanna Boogie. It features one of the wildest rockers ever to record for the legendary Sun label in Memphis. 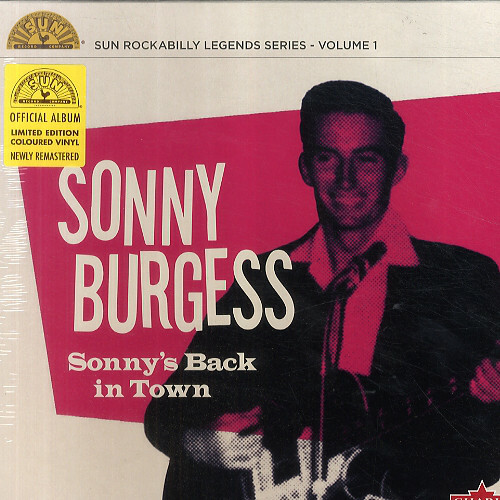 Sonny Burgess and his band The Pacers were from Newport, Arkansas, and had forged a hard-rocking style that unlike most rockabilly singers, owed almost nothing to country music. Proof of this is We Wanna Boogie, which featured on Sun Rockabilly Legends’ Series Volume One Sonny’s Back In Town in 2016. 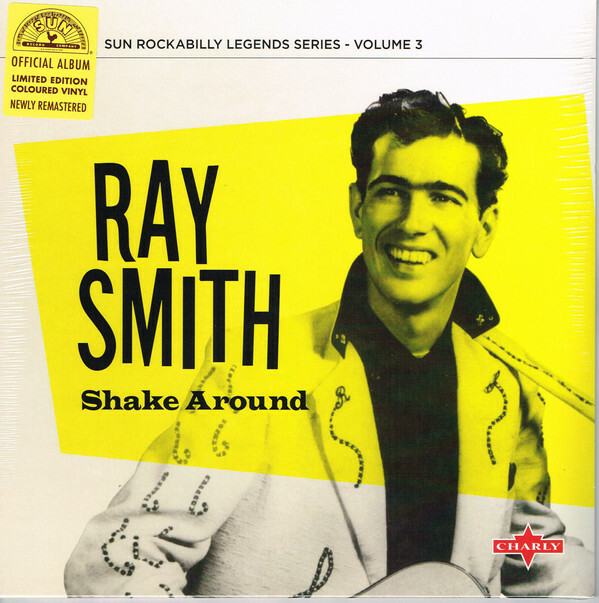 In early April 1958, Ray Smith released So Young as a single on Sun. Hidden away on the B-Side was an explosive cover of the Charlie Rich composition Right Behind You, on Sun. It’s one of the highlights of the Red Hot Boppers’ compilation, and Sun Rockabilly Legends’ Series Volume 3 Shake Around which was released in 2106. When Carl Perkins released Boppin’ The Blues on Sun, in May 1956, it should’ve been the fifth single of his career. However, the release of Sure To Fall had been postponed in March 1956. This made Boppin’ The Blues the followup to Blue Suede Shoes, which had been released in January 1956 and reached number one on the US Country charts and two on the US Billboard 100. This was the biggest hit of Carl Perkins’ career. Boppin’ The Blues had a lot live up to. Alas, it was a case of so near, yet so far, when Boppin’ The Blues reached number seven US Country charts and seventy on the US Billboard 100. 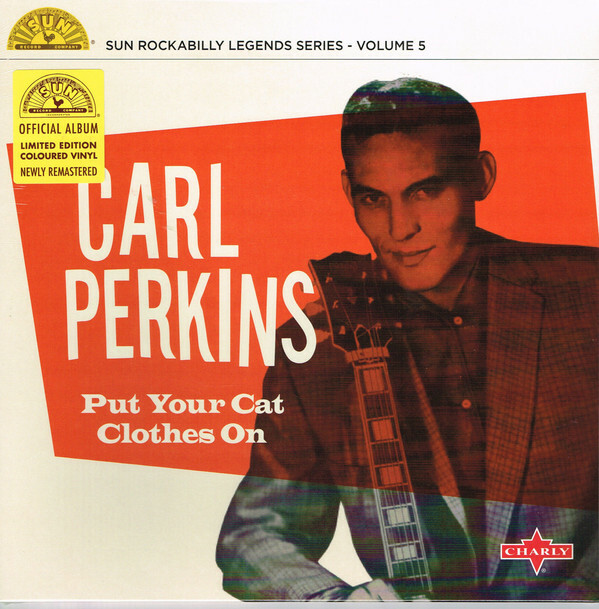 Despite that, Boppin’ The Blues is an irresistible rockabilly single that also featured on the 2016 compilation Sun Rockabilly Legends Series Volume Five-Put Your Cat Clothes. 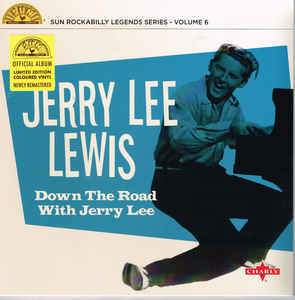 Sixty years ago, in March 1957, Jerry Lee Lewis released Whole Lot Of Shakin’ Going On. Not only did it reach number three on the US Billboard 200, but topped the US Country and US R&B charts. Across the Atlantic, Whole Lot Of Shakin’ Going On reached number eight. Since then, Whole Lot Of Shakin’ Going On has been has been hailed a rock ’n’ roll classic, while Charles L. Ponce de Leon called it: “perhaps the quintessential rockabilly anthem.” As a result, it’s only fitting that it featured Sun Rockabilly Legends Series Volume Six-Down The Road With Jerry Lee in 2016 and in 2017, the Red Hot Boppers’ compilation. Barbara Pittman was one of the artists that featured on Sun Rockabilly Legends Series Volume Eight-Those Rockin’ Girls in 2016. A year later, her 1956 debut single I Need A Man features on Red Hot Boppers. When I Need A Man was released on Sun, in late-September 1956, Barbara Pittman it found unleashing a powerful, sassy and needy vocal on this future rockabilly classic. When Gene Simmons came to record his debut single, the song chosen was one of his own compositions Drinkin’ Wine. It was released on Sun in April 1958, and Drinkin’ Wine went on to become a rockabilly classic. Drinkin’ Wine launched Gene Simmons’ long and illustrious career. His career was celebrated on Sun Rockabilly Legends Series Volume Ten-I Done Told You in 2016. The highlight of the compilation is Drinkin’ Wine, which is another rockabilly classic. Malcolm Yelvington was fifty-six when his cover of Yakety Yak featured on the Sun Rockabillys Volume 3-Rockin’ and Boppin’ compilation. However, his career began at Sun in 1954, when Malcolm Yelvington and Star Rhythm Boys released on Sun. Since then, Malcolm Yelvington had continued to record and play live. Indeed, his final album here’s A Little Life Left In This Old Boy Yet was released in 1997, when Malcolm Yelvington was seventy-nine. Sadly, four years later he passed aged eighty-three. His life and music is celebrated in 2016 on Sun Rockabilly Legends Series Volume Seven-Still Rockin’ Along. It features Malcolm Yelvington’s cover of Yakety Yak which returns for an encore on Red Hot Boppers. The Earl Bostic composition Ubangi Stomp is an oft-covered track. Many artists and bands have covered it, including Warren Smith and Carl Mann. His copper of Ubangi Stomp featured on Sun Rockabilly Legends Series Volume Nine-Rockin’ Mann, closes Red Hot Boppers. It was released as a single by the British label Charly Records in 1976, and is something a hidden gem. It’s far superior to many of the covers of Ubangi Stomp, and is the perfect way to close Red Hot Boppers. For any vinyl enthusiast looking for an introduction to rockabilly, then Red Hot Boppers is the perfect starting place. 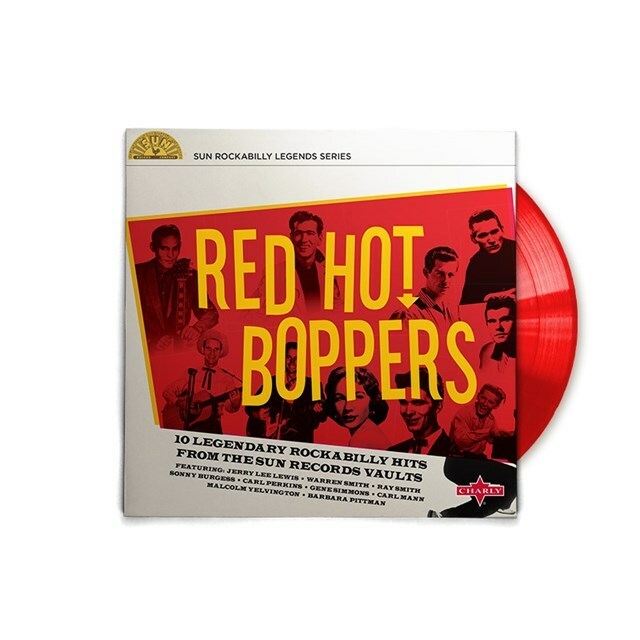 Red Hot Boppers, which was pressed 10” red vinyl, and released by Sun, as part of HMV’s Exclusive Vinyl series, is the perfect rockabilly primer. It features some of the giants of rockabilly, and several stonewall genre classics. These tracks feature on the ten volumes of the Sun Rockabilly Legends Series which was released in 2016. A year later, and Red Hot Boppers is a reminder, if any was needed, of the Sun Rockabilly Legends Series. However, anyone wanting a copy of Red Hot Boppers will need to be quick, as it’s a limited edition of 1,000. Already copies of Red Hot Boppers are becoming hard to find, and many rockabilly fans are struggling to find a copy. That is often the case with limited edition releases. However, what hasn’t helped was that many copies of Red Hot Boppers were purchased by the parasitic flippers who bought several copies to resell at a profit. That became obvious from the day that the titles on HMV’s 2017 Exclusive Vinyl series went on sale. By lunchtime, certain sellers on a well-known market place had several copies of HMV’s 2017 Exclusive Vinyl series for sale. That was despite buyers only being able to purchase one copy of each title. Doubtless, some of the parasitic flippers got fiends to buy further copies. It was Record Store Day 2017 all over again, with the parasitic flippers having copies of HMV’s 2017 Exclusive Vinyl series for sale at twice the original price. In some cases, the mark-up was between 150% and 200%. This meant that many lifelong fans were unable to afford copies of albums by The Creation, Iggy Pop, Status Quo, Cream, Eric Clapton and Stephen Wilson. While many flippers are still holding out for unrealistic and vastly inflated prices, some flippers seem to be experiencing cash-flow problems. This is a repeat of Record Store Day 2017. They’re so desperate to get rid off the albums that they planned to flip that they’re cutting prices. Some of the albums are for sale at cost price, while others are inviting offers. Hopefully, they’ll be hit with a series of lowball offers, and the flippers will be taught an expensive lesson. Ideally, nobody would buy from the parasitic flippers, and the market would work in a much more efficient way. However, when it comes to music, and especially limited edition releases, many record buyers let their heart rule their head. If that is the case, then the flippers will always will always make a killing. Maybe the answer is to make things tougher for the flipper? Record shops and large retailers selling limited edition releases where buyers are only allowed to purchase one copy should enforce the rule much more strictly. The large chains of record shops and large retailers selling limited edition releases should keep track of what their staff are buying. This would help ensure there were no cases of ‘insider trading,’ where staff members buying several copies of limited edition albums. ‘Regulating’ the smaller, independent record shops is much harder when it comes to limited edition releases. Year after year, there have been allegations of staff at smaller record shops having first pick of stock on Record Store Day, and when they receive limited edition releases. As a result, when the doors open on Record Store Day, often some of the best stock is gone. To rub salt into the wound, it has been alleged that staff members at those smaller record shops often, promptly flip the stock at inflated prices. When challenged about this in the past, they’ve claim that it is a perk of the job. Sadly, the only way to stop this from happening, is to vote with your feet, and find another purveyor of vinyl. Nowadays, many shops have started selling vinyl, including some of the biggest supermarkets. However, HMV have been flying the flag for vinyl for longer than most, and continue to do with their Exclusive Vinyl series. It’s a welcome initiative and always features some top titles, including Red Hot Boppers, which is a perfect rockabilly primer for newcomers to the genre. ← SOUL OF A NATION (AFRO-CENTRIC VISIONS IN THE AGE OF BLACK POWER: UNDERGROUND JAZZ, STREET FUNK AND THE ROOTS OF RAP 1968-1979).